First, what is a “heritage chicken”? This is the type of chicken Grandma would have made for Sunday supper. They are old breeds of birds that were raised for meat prior to the development of the commercial Cornish Cross, a hybrid chicken breed that reaches the end of it’s life expectancy at 6 weeks – not just because it’s reached the size to harvest, but because it’s organs can’t handle the rapid growth and it’s legs are often not able to hold it’s body off the ground. Because they are hybrids, even if they could live to sexual maturity, they’re offspring would not be suitable for meat production. 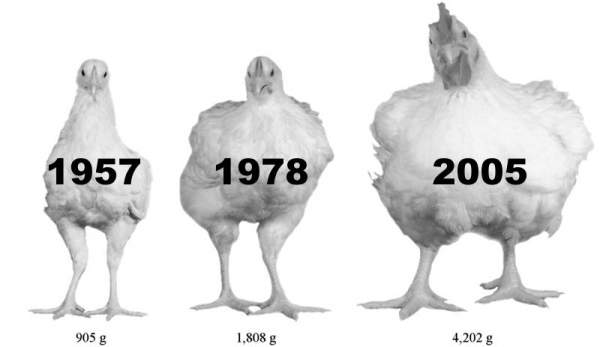 This graphic shows how chickens have developed over the last 50 years and demonstrates the growth difference at 56 days old. The bird shown for 1957 would be the heritage bird and would be grown another 3 months or so before eating as a Fryer/Roaster (described below). So let’s get back to the good stuff, cooking a heritage breed chicken. Depending on the time of year, Grandma may have cooked chicken different because as a chicken ages from hatching in the Spring to “retirement” their flavor and tenderness profiles change. All of the chicken purchased in grocery stores today (aside from a few select markets who are now trying to get back to the roots) are about 6 weeks old. They’ve been bred and fed in a way to grow BIG and FAST! This meat is super tender, but almost flavorless. A young chicken is called a “Broiler” – you can cook them fast and dry. Perfect for the grill, or quick cooking under the broiler. Between 6 weeks and 5 months of age, a bird will naturally begin to develop more size and flavor, but running around develops some muscle and muscle is tougher to eat. These birds are called “Fryers”. Take note that Grandma may have made fried chicken for Fourth of July or summer picnics (about 3-5 months after Spring). The next stage of chicken life results in a “Roaster”. These birds are bigger, more flavorful and need to be cooked low and slow to stay moist and tender. Roasters are 5-10 months old. Any chicken older than that would be a “Stewer” because to break down the muscle fibers, you need to cook them with moisture – so stew is the perfect solution, and a nice stew on a Winter’s eve is delicious and nourishing. Stewers have great, rich flavor and are often retired laying hens. Roosters can be stewed as well but have a distinct flavor that some love. We are raising our birds to be “Roasters” so here’s how we cook em up. All of the ways are essentially the same, with a different flavor profile. All are cooked in a 325 degree oven, covered in a roasting pan for about 2 hours. Rub chicken with butter and herbs of choice such as Rosemary, Basil or Thyme (my favorite). Fill the cavity of the bird with a cut lemon, half an onion and a couple garlic cloves. 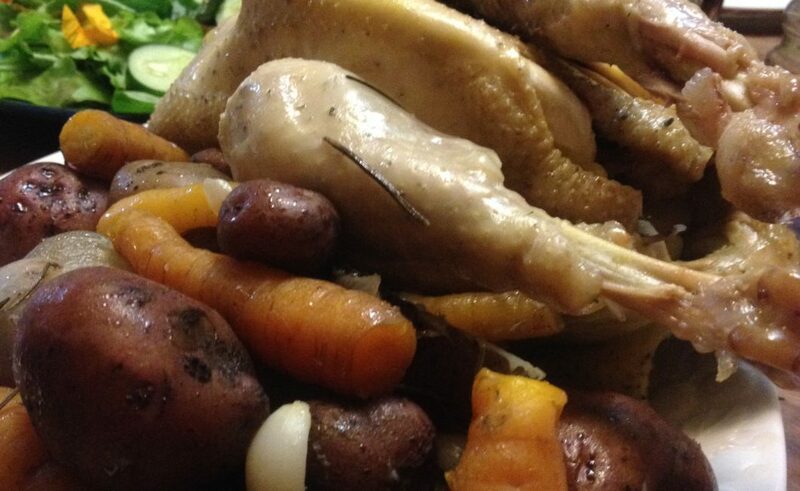 Make sure the bird fits snugly in your roasting pan or throw in some extra veggies. Tie the bird’s legs and tuck it’s wings under, cover with roasting pan lid or foil and bake for about 2 hours. Add some coconut milk, veggies and chili oil for a Thai inspired meal on Day 2 or make a Parmesan cream sauce with the drippings and diced up roasted lemon and garlic and serve over pasta (YUM!!!!). roasting pan or throw in some extra veggies. You could put fresh chiles, tomatillos, garlic and onion in the pan and run all that through the food processor or blender to make a delicious chili or simmer and add flour for an enchilada sauce for Day 2! Cut veggies of choice including garlic, onion, potato, carrots, yam, turnips, celery into large chunks. Lay on the bottom of your roasting pan and fill the cavity of the bird. Tie bird’s legs, tuck the wings, cover with lid or foil and bake. This way lends great follow up on Day 2 with a stew or meat pie. Day 1 – Roast the Bird, Carve it and Eat it. Day 2 – Pick the Bird, Make Enchiladas, Serve Over Pasta or Rice or on top of a Salad. Day 3 – Boil the Bird, Make Broth/Soup. And that is how to cook, eat and enjoy heritage, good old fashioned chicken – fresh from the farm, full of flavor and nutrients. This type of meat is more expensive, as one would expect from the investment of feeding and housing an animal for 5 months instead of 1.5 month, but once you start eating chicken like this you’ll never look at those poor, giant baby birds in the store the same. I have to say, the first time I looked at one of these little heritage birds, I felt a little cheated, like it should be bigger. We’re so programmed that bigger is better and that’s how you get the most bang for your buck. Don’t let their smaller size sway your decision, they are packed with flavor and nutrients you just can’t get anywhere else. This is also a chance to put your money where your mouth is (in so many ways). You can make your dollar speak out against animals cruelty, for support of small family farms, for locavorism, and for the right to eat clean food. 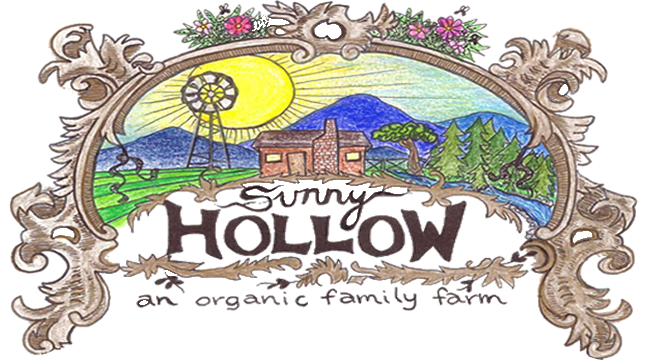 To buy a heritage chicken for Sunday supper, come visit us at the Spencer Creek Grower’s Market on Saturdays during the summer or if you can’t make it there, contact us directly.